After a life-long study of this number I want to put my discoveries about it down in writing so as to warn all Christians, and even non-Christians, of the earth-shaking events that started in the year 1998, and that will lead to the Rapture and the end of the world. Although this may seem far-fetched to you, when you finish reading this little tract, I have no doubt that you will share my view that these events will inevitably take place and that they are derivable from the properties of 666. It seems that 999 can be derived from the decimal expansion of the reciprocals of all prime numbers. Is this really true? I am sure that it is and I leave it to my readers to find a counterexample. I will come back and add more fascinating details about the other trigonometric functions with respect to 666 at a later date, but first I want to take a little diversion into triangles. Another interesting point was that the only artifact on display, claimed to be a possession of Jesus, was a piece of wood with a star engraved on it. The members of this cult believe it to be the true Star of David, but in reality it is the five-point star, similar to the Pentagram of Satan, that we find on the flags of America, China, the former Soviet Union, and many other great countries. On the night of April 18, 1997, I and my colleague, Bishop Donald B. Orsden, went to the grave of Jesus and Mary and began to dig. After digging for about 30 minutes we came upon some bones, hair, and nine clay tablets with engravings in Aramaic. We gathered them up, then excavated the grave of St. Mary where we found another casket containing nine more tablets. We then ineptly tried to restore the graves to their former condition before we started our dig and fled to my home where we carefully examined our find. Cometh fear and sudden death. Sorrows and none are comforteth. Mine alone are blest with peace. and identify those who defy Him. What are we to conclude from all this? Since it is a well-known fact that the entire history of the world is embedded in the decimal expansion of ``pi'', the only conclusion we can reach is that some catastrophic event will turn the world order, as we know it, upside down in those years. Moreover, it may turn out that those years represented by zeros, namely 1998 and 1999 might be the most ominous. Has some unreported event of great significance occurred? It might turn out that this is the year the Beast was born, and he is now living and growing up anonymously among us, waiting to reveal himself when he comes of age. A lot of commerce is now being conducted over the internet and in the near future this seems to be the main way business will be transacted. Those who do not have a computer or internet access will not be able to log on to the World Wide Web and will, therefore, be unable to transact business there. The mark must be accepted by all people, small and great, rich and poor. The mark must be easily accessible to them. It would have to be something they took for granted, something that they must be totally oblivious to. I believe that the World Wide Web and certain national currencies, as we shall presently see, exactly fulfill these conditions. I have done a computer search of prominent people -- politicians, business leaders, etc. -- to see if any of their names add up to 666. The most prominent one I have found is none other than Al Gore, the former Vice President of the United States. I expected him to become the president. I believe that most people feel he had actually won the election, but I suspect that higher forces working for the good of the world conspired to take the election away from him. 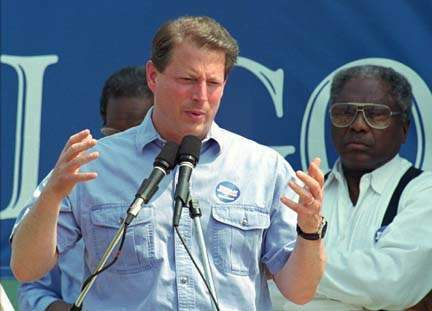 Al Gore is the antichrist. Who are those persons standing behind him? Note that the 32 in the above equation represents a space. It is interesting to note how this relation between his name and number is disguised. He takes a low profile by using lower case letters for his name. But no matter where and how they hide, the Beast and his minions cannot escape detection. It may not be that Al Gore is in fact the Beast, but Satan will undoubtedly have many powerful minions to do much of his evil work, and I am convinced that Al Gore has sold his soul to the devil. He is noted for his wooden appearance, something that makes me suspect he is nothing but a puppet being manipulated by Satan. Most of Europe is now using a new currency called the ``euro''. This means that the only currencies with which you can trade will be the euro, the yen, the dollar and the British pound. I have a strong premonition that this asteriod has been sent by God to destroy the evil in this world and it will fulfill the prophecy from Revelation cited above. Do not believe the calming words of NASA, the Jet Propulsion Laboratory, or the US government. They realize that disaster is imminent, but they cannot afford a world-wide panic while they try to deflect this asteroid from its orbit. But their very attempt to deflect it will change its orbit ever so slightly, causing it to make a direct hit on our planet. Any discoveries revealing other minions of Satan or 666 relationships should be sent to this website.